Attention AP students - the AP Pre-Administration is required and will be on Tuesday, April 30th during Cougar Time in the cafeteria!!! If you do not complete your AP Pre-Administration you cannot take your AP exams. Please see Ms. Lawson with any questions. The CATA Band of Blue will be holding color guard tryouts for the 2019 season on Monday, April 29th 4:30-6:30 PM. Prior experience is not required. Please see Mr. Retzlaff for more information. Have you purchased a yearbook yet? Yearbooks are now $85.00. You can order online at https://yearbookforever.com/ (search for CATA) or send a check (made payable to CATA) or cash to Ms. Christensen at school. The yearbook staff is finishing up the book this week! The district has a new volunteer registration process. If you'd like to volunteer in any of the UCPS schools you must complete the volunteer registration form located at https://www.ucpsvolunteers.com. This even applies to people who had registered in previous years. Central Academy of Technology & Arts PTSO has linked up with Amazon Smiles. This is a simple and easy way to raise money for our school! And you can do it while doing your regular shopping! n the fall of 1957, the world watched as Minnijean Brown-Trickey walked past armed guards and an angry mob into the formerly all-white Little Rock Central High School. 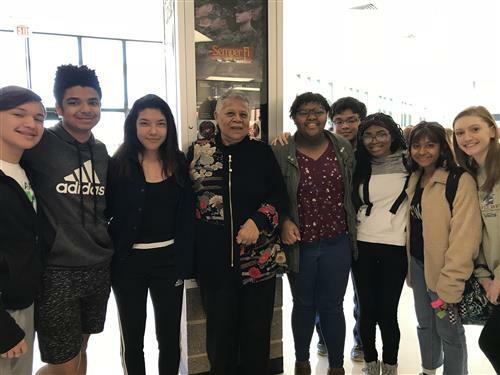 At the time, Brown-Trickey didn’t realize that being a member of the Little Rock Nine would spark her decades-long advocacy of civil rights, which most recently brought her to CATA on Feb. 25 where she talked to students about her experiences overcoming racism. The school counseling team was illuminated in an original ode by Mrs. Henry's AP Literature class during Guidance Appreciation Week. The students were tasked with creating their own poem "Ode on a Guidance Team" using John Keats's "Ode on a Grecian Urn" as a guide. Students read their composition to the guidance members and presented them each with a copy.